I can't possibly believe that it is already the holidays, but yet here they are. Which means it is time for festive crafting and baking! Yay! 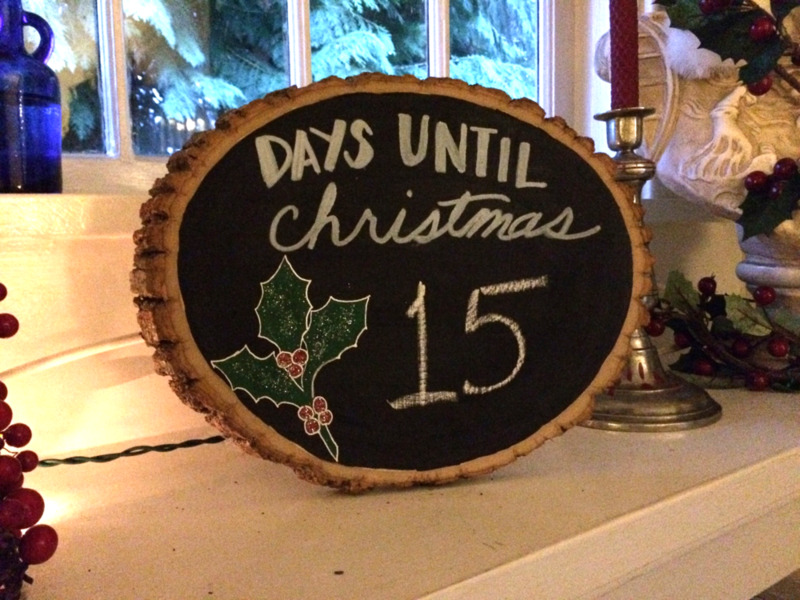 Today I am going to make a Days 'til Christmas countdown chalkboard. This project is pretty quick and even better, cheap to make! Chalkboard paint, I used the Rustoleum brand's version but you can DIY it with this recipe. You may choose to use a stencil or throw caution to the wind and free hand it! Total cash spent: $20! Pretty sweet deal, if you ask me! Paint the wood plank with the chalkboard paint using the foam brush. I kept a little boarder of wood-grain, but you can do what you like. Differences are the spice of life, guys. Allow this to dry completely! Seriously! Plan your message with pencil and ruler, then draw over with paint, paint pen, or chalk pen. Let dry... then write in how many days 'til the big guy makes his visit to your abode! Optional: add ribbon to hang by stapling ribbon to the back. If you're handy with a drill, you could drill two holes and tie a bow with some charming jingle bells. It is crazy charming on my mantle between my festive Marc Antony, red taper candle, and a twiggy tree. Check out my Holiday Home Tour to see how it fits in with the rest of the decor. The Betty Holiday Express is gonna keep on rolling all month with recipes, DIY decor and other fun goodies so stay tuned. As always, you can share your favorite crafty holiday traditions on #bettybetatester and on the social medias.